These fiery pink inflorescences belong to Bistorta affinis. Known as Himalayan bistort, the species is native to the Himalayas and neighbouring regions, growing at elevations of 3000 to 4900m above sea level (10000–16000 ft.). Whether carpeting the ground of a cultivated garden or a mountainside slope, it brings welcoming colour to the landscape. These rhizomatous herbaceous perennials will typically reach 10 to 25 cm in height and form a mat-like groundcover. At higher elevations, the species takes on a more semi-prostrate growth form; the leaves become increasingly cushion-like, though the inflorescences remain erect. The flowers will take on varying shades of pink in the wild as well as in cultivation, turning dark red and brown in the fall. The inherent cold hardiness and colour have made Bistorta affinis a popular ornamental groundcover in a variety of cool-tempered climates. Three different cultivars of Bistorta affinis (‘Darjeeling Red’, ‘Donald Lowndes’, and ‘Superba’) have won the Royal Horticultural Society’s Award of Garden Merit. 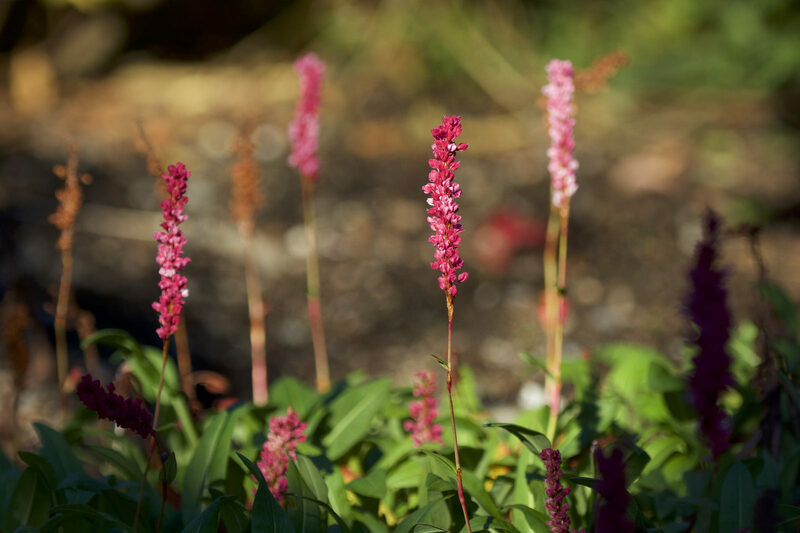 Bistorta affinis ‘Border Jewel’ was apparently selected for cultivation because of its long-lasting inflorescences. An ongoing taxonomic disagreement exists for several genera in this group of the Polygonaceae; you may see this species and its cultivars under the names Persicaria affinis, Polygonum affine, or Polygonum donianum. Communities native to the Himalayas have traditionally relied on the medicinal properties of Bistorta affinis. The whole plant is often used for treatments, though roots (rhizomes?) alone are sometimes either chewed or powdered with boiled water. Afflictions treated include coughs, colds, gastro-intestinal disorders, and diarrhea. Some Himalayan communities in India have apparently made use of it as a stimulant. The Flora of Pakistan account for Bistorta affinis also notes the use of rhizomes for tea. In 1968, a study published on the distribution of Bistorta affinis in Himalayan alpine communities reported it to be abundant in some places while absent in others. Avoided by grazing animals, it can emerge as a dominant vegetation on heavily grazed slopes with moist and porous soils. In habitats unaffected by grazing, however, Bistorta affinis was generally less dominant. The authors suggest that the low growth form allows plants of Bistorta affinis to be easily outcompeted for light by the taller vegetation of other species. Additional photographs of Bistorta affinis can be found on efloraofindia: Bistorta affinis. One of the best places in the world to see this species (and many, many others) is Valley of Flowers National Park; a stunning valley in the high-altitude Himalayas, it is a perfect showcase for Indian alpine flora. what time of day was this taken? Just about two hours before sunset. It has that look. Lovely photo! Exotic plants in this family are well known to be very weedy and difficult to kill. Both the rhizomatous and the distasteful, or unpalatable nature of these plants contribute little to ecosystem function. It would be better not to promote plants that do not participate in the local food webs. I quite enjoyed learning more about a plant I am somewhat familiar with and enjoy Imagining exotics in their homeland . Thanks! Despite the description here referring to this plant as unpalatable, it features prominently in Stephen Barstow’s book “Around the World in 80 Plants”. His “Edimentals” website even has a recipe for perennial veggie quiche topped with dried bistort. (see: http://www.edimentals.com/blog/?tag=with-dried-alpine-bistort) However, Barstow’s definition of “edible” appears to simply mean that you can eat it and it won’t kill you but some of the edible species he features do taste pretty nasty. I do so love this website, all the gorgeous photos and the great comments! Leave a Reply to Roger Rosentreter Click here to cancel reply.